Get baking and have fun! To use up leftover speculaas and to surprise a friend who, because of her allergy to gluten, had never eaten tiramisu, I came up with a combination of both: speculamisu. It’s the same mix as for tiramisu, but instead of using ladyfingers (aka boudoirs) dipped in coffee, I use speculaas. Let’s face it: after years of tiramisu revival, you’re bound to be ready for a change. If so, this is a great alternative. Mix 4 egg yolks with 100 g icing sugar and a splash of amaretto. Add 500 g mascarpone and mix well (you don’t want any lumps). Beat 4 egg whites until stiff (add a small pinch of salt to make it easier). You should be able to hold your bowl upside down without the egg whites moving. Carefully spoon the egg whites under the mascarpone mix. Put a layer of speculaas at the bottom of your serving this (if you didn’t have time to make them yourself, you can off course use shop-bought speculaas). You don’t need to soak them in anything, a couple of hours with your mascarpone mix and they will be soft. Add a layer of mascarpone mix, another layer of speculaas en so on. 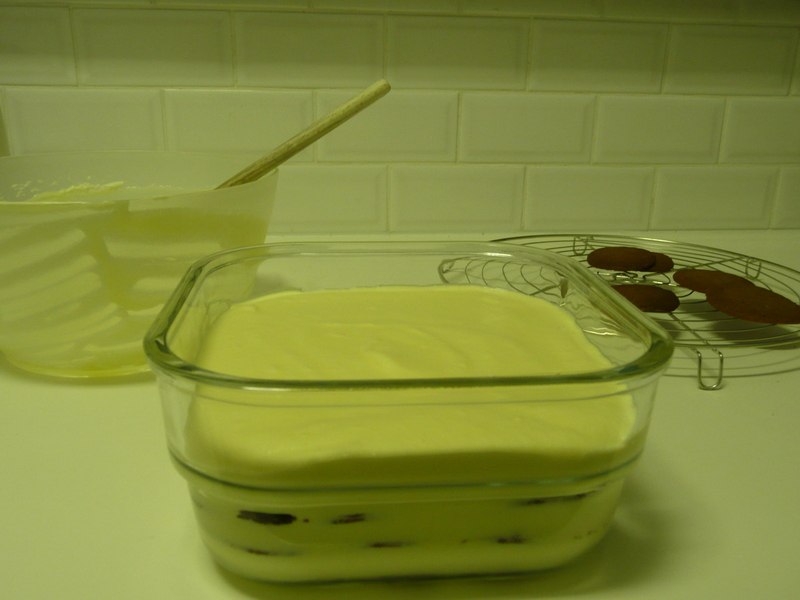 End with a layer of mascarpone mix. That’s all there is to it! Put in the fridge for at least 4 hours or overnight and you’re ready to go. If you want, you can sprinkle some cacao powder on the top to decorate. If you prefer a regular tiramisu, just swap the speculaas for ladyfingers and dip them in strong coffee first. Enjoy! I really love these cinnamon cookies that are mostly served around Sinterklaas, at the beginning of September. 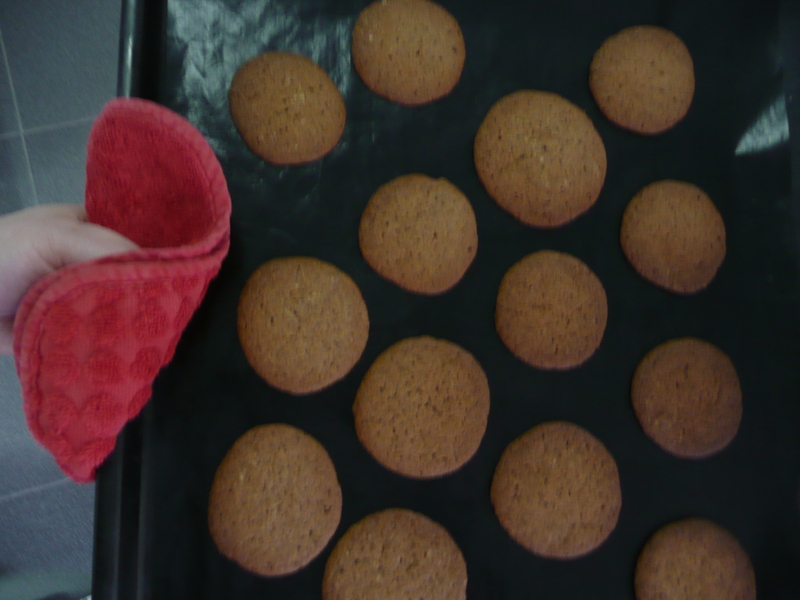 But that doesn’t stop me from eating speculaas the whole year round, and this family recipe does just the trick for me! In addition, you can easily make them gluten-free if you are allergic to gluten. With that allergy, you can’t eat bread, pasta or anything containing flour, which includes most desserts and of course cookies. But there is a solution: you can buy gluten-free flour and gluten-free baking powder. If you live in a modern country such as New Zealand, you’ll find them in the gluten-free isle of your supermarket. In countries where people thing that someone with a food allergy is just someone who wines too much (like Belgium), you need to go to a health food store to get them. Gluten-free flour has a less dense and more powder-like consistency then regular flour, so it clings less to other ingredients. But for most cakes and bakes, that is not an issue because eggs can do all the sticking you need. That’s also true for this recipe. In addition, as the cookies are really flat, you don’t need any lift so you can do it without baking powder. If you’re hungry now, I’ll have to disappoint you, the cookie dough needs to stand overnight… For starters, melt 150 g butter in the microwave. Add 125 g dark brown sugar, 1 egg yolk, 2 tbsp of water and 1 tbsp of speculaas mix. Or if you don’t have this mix in your spice rack, just grind the seeds of 2 cardamom pods and add them together with 1 tbsp of cinnamon. Now add 200 g of gluten-free flour or self-raising flour. You can use your hands to kneed the dough so that everything is combined. Let the dough rest in a cool place for 24 hours. The next day, heat the oven to 180 C. Knead the dough again a bit to loosen it, roll little balls and flatten them on a baking sheet. Make sure to space the apart a bit as they will spread in the oven. Bake for 12 min and allow to cool on the baking sheet for a couple of minutes before transferring them to a wire rack to cool completely. Enjoy! Use up left-over speculaas in speculamisu or in speculaas bread or us as a base for cheesecake.